Besiktas and Paris Saint-Germain are considering signing Newcastle United players – but both have back-up plans in place. Besiktas have confirmed Papiss Cisse is on a three-man shortlist, although they are yet to bid. Despite reports Yohan Cabaye has reservations about joining PSG, coach Laurent Blanc is still considering a bid for the £25m-rated midfielder. While interest in Cisse will be good news as far as the Magpies are concerned, as it could give them room to manoeuvre as they look to add another goalscorer, they are extremely reluctant to part with Cabaye. Fortunately, the France international seems in no hurry to leave this month either. Besiktas director of football Önder Özen said: “Papiss Cisse is a player I really like. He’s the type of player who could make a difference at Besiktas. “We are considering three players, I would give Cisse an offer but it’s up to the club. The hoped-for arrival of Borussia Moenchengladbach’s Luuk de Jong would push Cisse, already fourth in the striker pecking order, further down the queue and persuade him it is time to leave a club he joined two years ago. Signing De Jong, valued at £8.5m, may be contingent on moving Cisse on. Besiktas could try to strike a loan deal rather than commit so much money to a player badly out of sorts this season, scoring just three goals. After an injury to Adrien Rabiot, Blanc is looking for a midfielder and while he does not seem to have written off Cabaye, he is also considering Roma’s Miralem Pjanic. Blanc said: “Pjanic could be a good alternative to Cabaye. Dan Gosling is more keen on leaving, but with his loan to Blackpool over Newcastle manager Alan Pardew is talking about retaining the 23-year-old until his contract expires at the end of the season. Gosling (left) performed well in the Championship, but his £30,000 wages are out of the Seasiders’ reach. “In a perfect world, we would find a permanent move,” said Gosling’s agent, former Darlington manager Dave Hodgson. “That would suit both parties in terms of Dan knowing where his future is going to be and Newcastle in terms of some type of remuneration. Both parties would get what they want. “Alan has had a long chat with Dan. 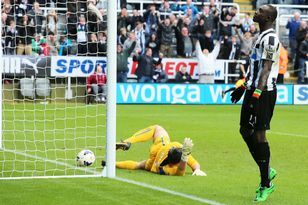 The club has lost Jonas Gutierrez – and he would like to keep Dan at the club.